Home / Black & White / Squirrel-proof birdfeeder – Ha!! Not a stunning picture. It was taken quickly and at a fairly long (250mm) focal length through one of our windows. At first I didn’t know what to do about this. There were two options depending on how the squirrel got there. 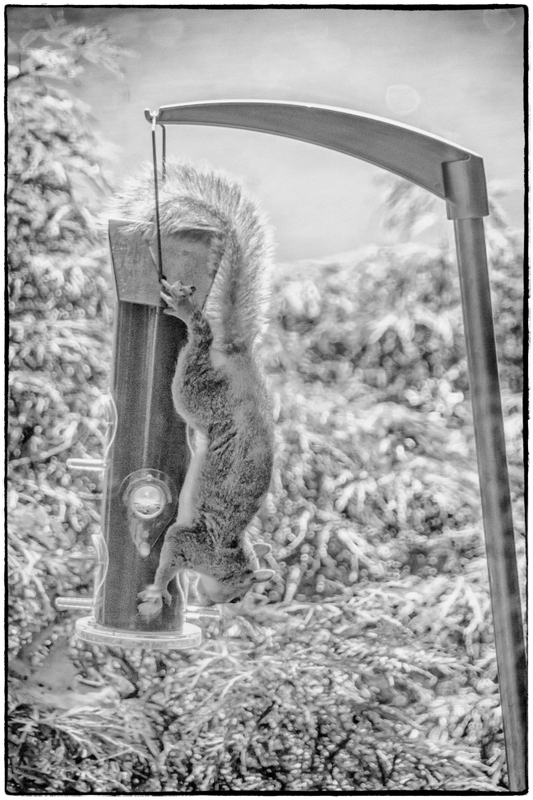 If it jumped from the Japanese Maple behind then the solution would be to move the feeder far enough away from any tree that it wasn’t possible for the squirrel to jump so far. If, on the other hand, it was climbing up the pole then moving it wouldn’t help. In this case I’d have to buy a baffle to put on the pole or above the feeder (or maybe both?). I’ve been observing the situation closely and I’ve determined that the squirrel climbs straight up the pole so it looks like I’ll have the look into getting a baffle(s).